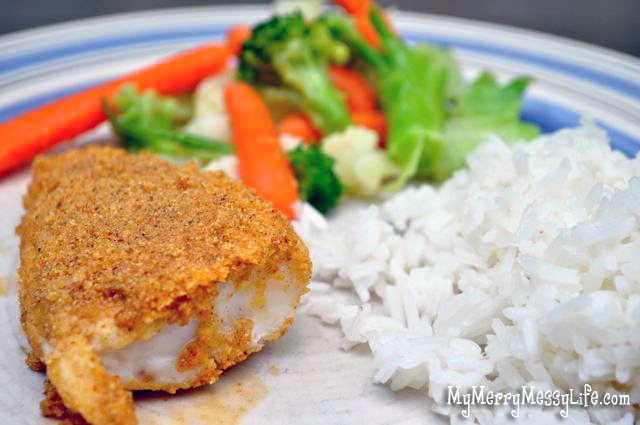 Here is another mouthwatering recipe made with the all-amazing coconut oil! Did you know coconut oil can be a vegan alternative to butter? It also makes a great paste for adding breading to meat and fish because it adds a wonderful coconut flavor and fills the kitchen with a heavenly scent! Mine is still lingering with it after cooking this tonight. Even the kids enjoyed it! 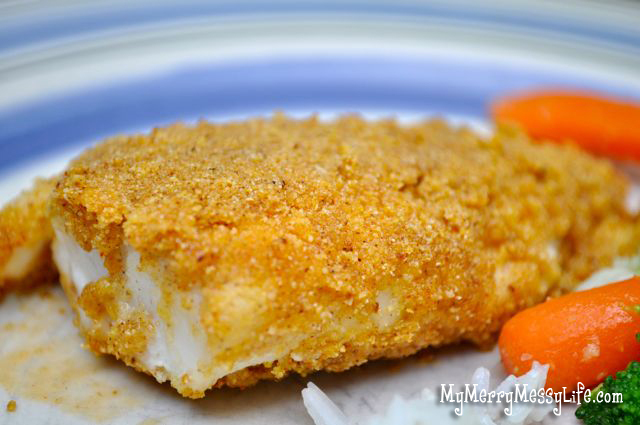 If you’re a vegan or vegetarian who eats fish, this is a tasty dinner choice for you! Any other savory spice of choice will probably work! Depending on the cook time of your rice and veggies, you might want to start cooking them first, as the fish takes only 10 minutes total to prepare AND cook! In a bowl, combine the cornmeal and spices and stir. On a large place, spread two spoonfuls of the coconut oil around the plate. Cut each fillet in half, and smear in the oil, then dip in the cornmeal mixture. Repeat if desired, but I did not find this step to be necessary. Drizzle two glugs of olive oil around a pan and heat. Once it is very warm, saute the fish for about 5 minutes, flipping halfway in between. Done!